JAMSHEDPUR. JUN.27: The Students of Singhbhum Homoeopathic Medical College and Hospital in Sakchi are left in lurch as its permanent teachers have gone on a mass leave since March demanding salary hike and promotion. 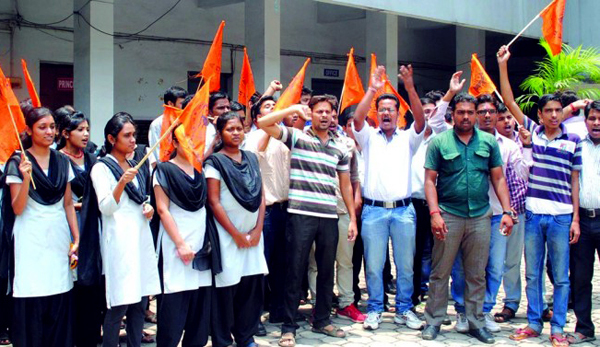 In protest against the delay in resuming of classes students along with Akhil Bharatiya Vidyarthi Parishad (ABVP) activists protested at the college to demand regular classes. They also clocked up the office. Students along with the activists have threatened to agitate in front of the district collectorate on Monday if their problems are not solved soon. The students have come from other districts of the state as well as from other states like Odisha, Andhra Pradesh. Though the district deputy commissioner is the chairman of the governing body, Amitabh Kaushal, the deputy commissioner of East Singhbhum already given in writing to the state health department about his decision not to be chairman of the institution. In that case a new governing body is yet to be re-constituted to take a decision. The students pursue a Bachelor in Homoeo Medicine and Surgery degree from the college affiliated to the Vinobha Bhave University. Dr.Kulwant Singh, the Principal of the college claimed that he has visited New Delhi and it has been decided by the Central Council of Homoeopathy to form a new governing body by the department of health and sanitation to take a firm decision. He expressed confidence that the problem will be solved soon.